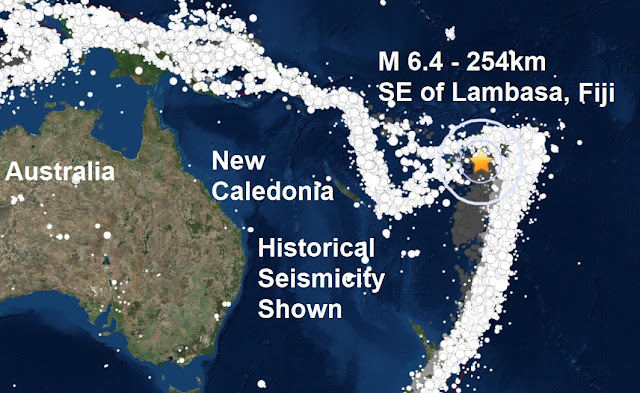 A second major quake in 24 hours is very much a rare occurrence these days but a very deep mag 6.4 - 254km SE of Lambasa, Fiji has brought up the 6th major quake of August and the 61st of a very low count for 2017. A green alert for shaking-related fatalities and economic losses. There is a low likelihood of casualties and damage. What is even more remarkable though is the lack of major quakes mag 7 or higher. 2017 has seen so far only 3 quakes at mag 7 or higher, the biggest being the mag 7.9 in Papua New Guinea, way back in January, nothing has been recorded in the mag 8 range which is also highly unusual and could be the lowest mag 7+ count in modern history.